Keys to Reading seeks excellent teachers to open independent after school centres on a part time basis from two hours per week. We are looking for dedicated, professional individuals or companies to deliver Touch-type Read and Spell courses throughout Ontario. This is an exciting and rewarding role with huge growth potential for those interested in starting their own independent licensed TTRS Tutoring Centre. Sound Interesting? Please read through the following information, and if you’d then like to proceed to the next stage of our getting to know each other, complete and return the Statement of Interest Form by direct email to sales@keystoreading.ca or fax it to us at 519-472-9816. If you prefer a personal conversation please provide your telephone number and we will be happy to contact you. TTRS Courses are typically held after school and/or Saturday mornings. After school centres are often established as a joint project between a hosting school/college/ or other computer equipped venue, the teacher and TTRS. Many TTRS Centres are run by local dyslexia associations, groups or companies developing literacy, schools, colleges and self employed teachers. Our clients are students who have some form of difficulty with reading, writing or spelling. This may be for a number of reasons including learning disabilities, sensory impairment or simply through a lack of past teaching and learning. 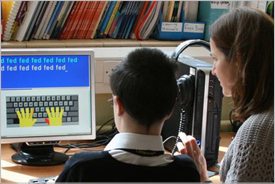 The TTRS course is uniquely designed to assist students of all ages who have literacy difficulties with a method of delivery that teaches touch-typing in a “dyslexia friendly”, multi-sensory way aiming to develop literacy, confidence and self esteem with measurable success right from the start. Who can teach TTRS? For all tutors, what is of paramount importance is the ability to create a supportive, motivating and positive learning environment and to have an excellent rapport with children, their parents and adult learners. You do not need to be able to touch-type to deliver TTRS, nor do you need to be highly computer literate. Training: comprehensive training in the method, approach and delivery will be made available. You will have the opportunity to pilot the TTRS course with your students and thoroughly evaluate TTRS with successful delivery before entering into a licence between us. Teaching and learning assistants with empathy and understanding of literacy difficulties often make excellent tutors under the guidance of a qualified and experienced teacher of those with learning difficulties. Copyright © 2010-2015 Keys to Reading, All Rights Reserved. Design By: LOWD Media.